This is how professor Klaus Schwab, Founder and Executive Chairman of the WEF, summed up the ominent expansion of Internet connected devices on the production line and all through the consumption cycle, and how that process might radically transform our lives as a society that’s own sustainability depends on collaborating with and depending on the machines. The first industrial revolution brought the steam engine, mechanizing and streamlining some of the manual labor our ancestors were doing. The second, introduced electricity, which developed the assembly line and paved the way for mass production (and consumption, which in return opened the gates to modern capitalism as we know it today). The third industrial revolution arrived a bit later with the expansion of computers and automated robots into factories, replacing human workers in the process. While some positivists argue that the first three industrial revolutions have propelled us as a human society to the modern age (and that technology is intrinsically a tool for the goodness of society), others, who were directly affected by the invasion of technology, disagree by saying that adopting novel ideas in a hasty manner has proven to have damaging long-term effects on society and the role an individual plays in it (read, Elon Musk Admits Automation At Tesla Factory Was a Bad Idea). The idea about tech adoption and growth is that it happens so rapidly that policy makers and societies, in general, rarely have the opportunity to fully realize and consciously understand the impact such rearrangements could have on both the long and the short run. The aptly named ‘Industry 4.0’, while still being based on automation and the convergence of robots with computers on the production line, factors in a new dimension which was not widely available before: intelligence and machine learning algorithms. “Smart factories” promise to leverage interconnected-yet-decentralized networks of machinery in what is known as IoT, which requires less human involvement, and would force them to adopt different roles such as monitoring, maintenance, quality checks, and many more. In short, Industry 4.0 allows for further cooperation between machine and man, transparency of the production process through data (consumers can track, through the blockchain, the trajectory their smartphone took before it hit the shelves), efficiency (maintenance of the machines means they become safer for human workers to be around), and long-term ROI. Though, opening the door to Industry 4.0 would cause a seismic shift in the way products are made, and would also open the door wide to a whole new set of problems that weren’t faced by factories of the past like: data security, instability of the systems being used, lack of qualified human power (on a global scale), and any outage on the production line would cost companies millions of dollars in losses. I’m not here to set any alarms or anything, instead I’m aim to highlight the opportunity posed at emerging markets and budding economies across the globe, like how the kingdom of Bahrain is developing a set of new strategies to attract the likes of Mondelez & FMCG (the makers of the Oreo cookie) to open up factories in the 765.3 km² kingdom. 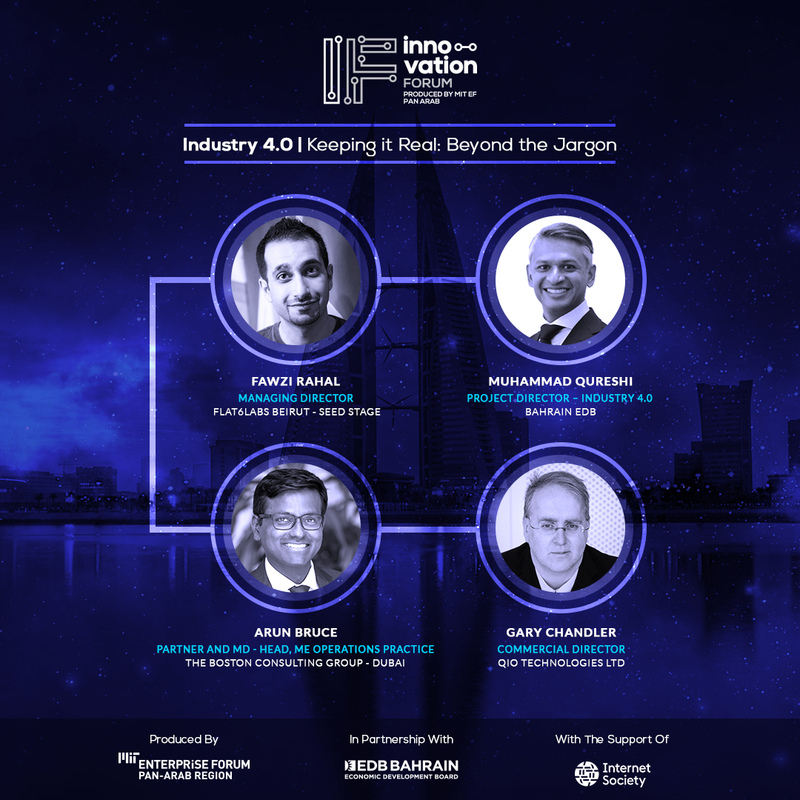 Early adopters of Industry 4.0 have already started to reap the benefits of the technology, so it is only a matter of time that global industries realize the necessity to keep up the pace with market demands and fuel the urge to spur economic growth within a rising tides of emerging economies. Register today to attend ‘Innovation Forum’ on October 1 in Bahrain, and be part of the discussion.